Converting Mechanical speedo to electric. I've done a lot of looking (maybe in the wrong places?) but have been unable to find many people swapping their cluster with mechanical speedo to clusters with a higher mph & rpm. The only clusters I've found that have 140-145mph speedometers are all electronic speedometers. Has anyone found the best way to do this using factory gauges? I'm not afraid of wiring and prefer using factory style parts for the conversion. 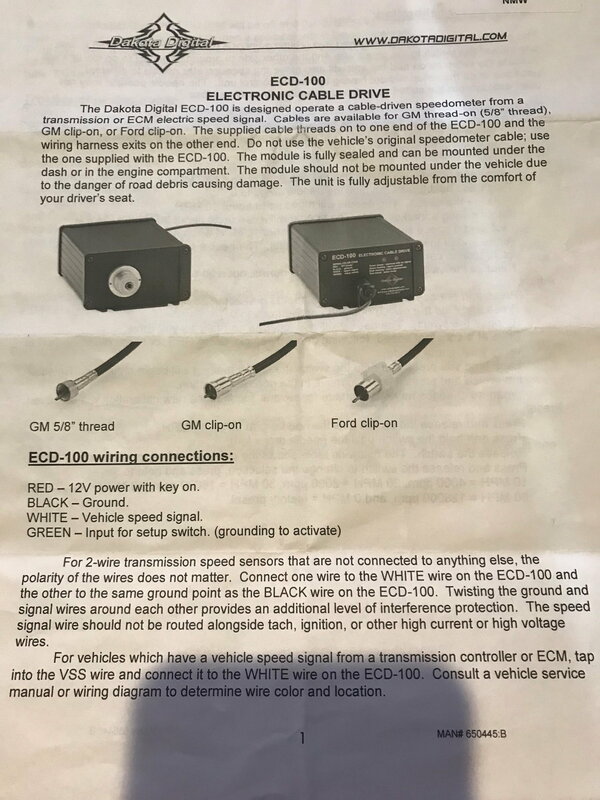 Re: Converting Mechanical speedo to electric. So you're saying you want to remove your mechanical speedo, and use an electronic speedo? Pretty sure the speedometer gear housing just pops out of the 700r4 and you pop in a electronic speed sensor. Whatever sensor came out of a transmission from the same year as the speedometer you're using. I'd imagine they're all the same....although maybe not. ...or are you saying you want to swap the WHOLE cluster? ...and you're not sure how to wire it? ...that's certainly do-able, but I don't have the info on how. -sorry. I would be open to either route. Would prefer to just swap gauges, and add a sensor. Are the tachs interchangeable? If I swap the whole cluster, I'll still have to get a speed sensor and everything. I might have to get the pinout diagram for the cluster and move some terminals around to mate correctly with the different model year cluster, that's not the challenge. After extensive research, I've found that I can get the Dakota speedo interface module, since I don't have the yellow buffer module(which is required for the electronic speedo to work). Had anyone had any experience with this? My car's issue was the opposite of yours. My car was needing to have the factory mechanical speedo communicate with a 4th gen 4l60e. The car is currently running a Dakota Digital ECD-100 ELECTRONIC CABLE DRIVE, the system works well. Not sure if this of use to you but here is unit's paperwork that came with the car. Converting from mechanical to electric fans? converting my car from electric fan to mechanical? Quick Reply: Converting Mechanical speedo to electric.